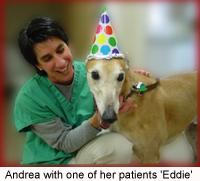 Double A Veterinary Hospital was established in April of 1997 by Dr. Andrea Autorino. Her goal was to build a practice that would offer the best care in all areas of veterinary medicine and provide not only for the physical needs of her patients, but for their emotional comfort as well. Over the years, our hospital has grown into a practice that is pleased to serve over 7000 clients. Our team consists of three doctors and twelve members of support staff - all crazy animal lovers. All of us here make every effort to develop a personal relationship with every patient we see. We are primarily a small animal practice specializing in the health care of companion dogs and cats. We take great pride in our hospital and the services we provide. In addition to preventive physical examinations and immunizations, we offer surgical services, ultrasonic dental cleaning, lab work, radiology, pet boarding, medicated bathing, and much more. Our hospital also carries a wide variety of prescription diets, flea/tick control products, and heartworm preventatives for your pet's overall health. Monday - Friday: 8 a.m - 6 p.m.